I am not a fan of a fat, heavy planner, so I use a tiny wallet to hold credit cards and such and, on shopping days, carry a large wallet with coupons in it. That larger wallet holds things like store discount cards and the back-up credit cards. By keeping most of my cards out of my planner, I keep my planner fairly light. But through the course of my last two months of doing this wallet experiment, I've had occasions, that are likely to reoccur, where I needed something from the backup wallet that wasn't in my planner. So, like any good plannerd, I made a list. It's enough stuff that it can't go in my tiny wallet (with my credit card, bank card, cash, medical card, and id). But I refuse to carry all the store discount cards and coupons just for trips to the library or coffee shop. So I put the gift cards and doctor cards in the front of my planner (so I see and remember to use the gift cards) and the backup credit card, medical cards, and library card in a business card holder in the back. Three different places for cards might seem excessive, but the wallet goes everywhere, the planner almost everywhere, and the big wallet only on shopping trips. The system works so far, and working is the purpose of systems, after all. Is a system using three wallets (well, two wallets and a planner) excessive? 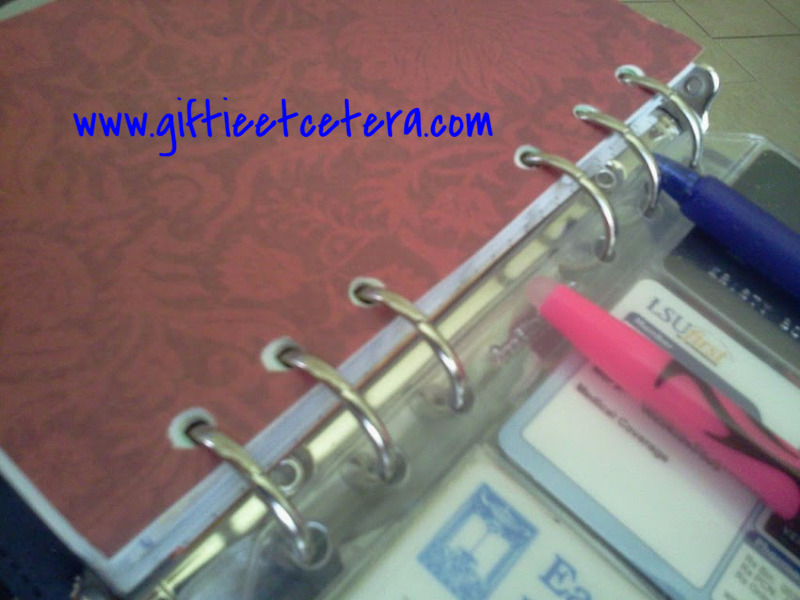 Do you keep any cards at all in your planner? I don't keep any cards in my planner. I know a lot of people use their planner as a wallet but I never have. I prefer having a separate wallet. My daughter uses hers as a wallet and loves it. I used my filofax as a wallet for about a year. I think it was a great thing to do as it really reinforced the habit of carrying the planner everywhere I go. 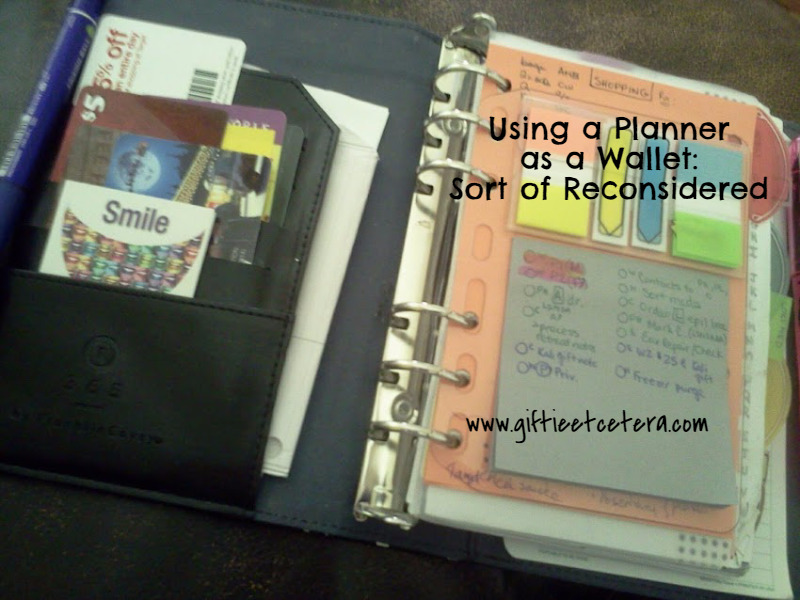 Eventually, that habit was totally set and I realized that there were a lot of compromises involved in keeping your wallet stuff in your planner, so I reverted to pocket wallet, with a couple of wallet things in my planner but not many. It works really well. It was super-inconvenient when I needed to carry my wallet with full hands, which was solved by keeping a pocket wallet separate from my planner. I now also have a pocket notebook so I can still take a note during times when my planner is not at hand, very helpful. If three wallets work for you, I don't think it's excessive. Last year I had a lot of stuff going on and I carried all of it around with me. I use my planner as a wallet whether I'm in a pocket or a compact. It makes more sense to me when I'm paying bills or out and about; everything's right where I need it. And since I keep it accessible my husband can easily grab whatever card he needs and see what I'm doing for the day at the same time. Josh: I'm using a separate notebook these days too. I'm experiencing "planner noise", if that makes any sense. Past and future have started to meld together in my planner and I need one bright clean sheet to clear my head and start the day. Whoa! What timing. I get really tired of juggling my wallet, card case, and planner, especially at checkout counters with people behind me. Plus cashiers are always rushing to get to the next customer, so everything gets shoved into wherever. I've never been a fan of using my planner as a wallet, can't stand my finances to be on display, but this was driving me nuts. Took a Target $1 Spot pouch, trimmed it to size, 2 seams through the sewing machine, punched holes for the planner. Voila! Removable and PRIVATE wallet pouch. (Have to get another one to fit my Personal size planners.) Now depending on the situation, I can have my wallet in there, or not.